Full Face – Backing ring and stub are one piece. 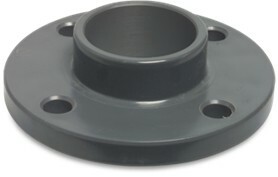 PVC PN16 PN10 Flange, Stub Flanges or Flanged Joints main function is to allow seperation, to connect flanged valves and or vessels which require higher strength in tension. Also Connecting different material types such a PVC to Poly or Steel together. Speak with a member of our team . We will be able to tell you with a few quick questions. Where applicable our PVC fittings are according to ISO 727 and WRAS for potable water. Metric Fittings with threads have DIN thread ie taper male by parallel female. DIN 2999. 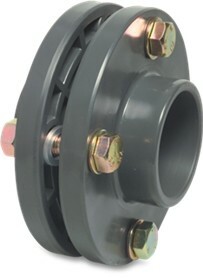 Imperial fittings conform to BS 4346/1 ISO 9002 for pipes made to BS 3505 and BS 3506. Threads are parallel BS 21 male and female. Our helpful team welcome your questions. 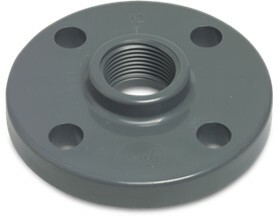 PVC DN Full Face Flange x BSP Female Thread.